Calgary Moms Trade Fair ~ Sunday, April 14th, 2018 ~ 9:30am – 3:30pm. Why should you exhibit? Trade shows are a high traffic one-stop shopping experience for consumers looking specifically for your products and services. Exhibiting exposes you to a targeted audience in a cost effective way. Personal interaction, product/ service display and sale, sampling and generating leads will give families many ways to remember you. See current list of exhibitors for our April 2019 trade show. Marketing Campaign Our marketing and advertising campaign includes paid advertising in Calgary’s Child March/April issue, Calgary’s Child Baby guide, and a listing on Calgary’s Child website resource guide. Paid advertising on AMP Radio Calgary the week before the show. Mentions of our show through our media sponsors Shine 88.9FM and AM700 The Light and a website event listing. Paid advertising on social media (facebook, instagram, twitter) along with email blasts sent to over 4,000 subscribers on CalgaryMoms.ca, over 2,000 subscribers on CalgaryMomsTradeFair.ca. Exhibitors selected to attend the Calgary Moms Trade Fair will have the opportunity to share products, services and business opportunities with local moms. Anticipated attendance is 500+. Exhibitor Table Prices & Information: Please read the following carefully. – 6 foot table & 2 chairs in an approximate 10×10 space. Please bring your own table cloth. – An additional small table, small shelving or clothing rack (instead of 6 foot) is permitted within space allowed. – Use of vertical floor sign behind table, on one side of table or sign hung on wall behind table is permitted. – Inclusion of 150 business brochure/business cards and/or samples for show bags to be handed out. – Inclusion of business discounts or sales during event will be listed on our website and in our show guide (150). – Business name shown on our Exhibitors page on our website for approx 2 months. 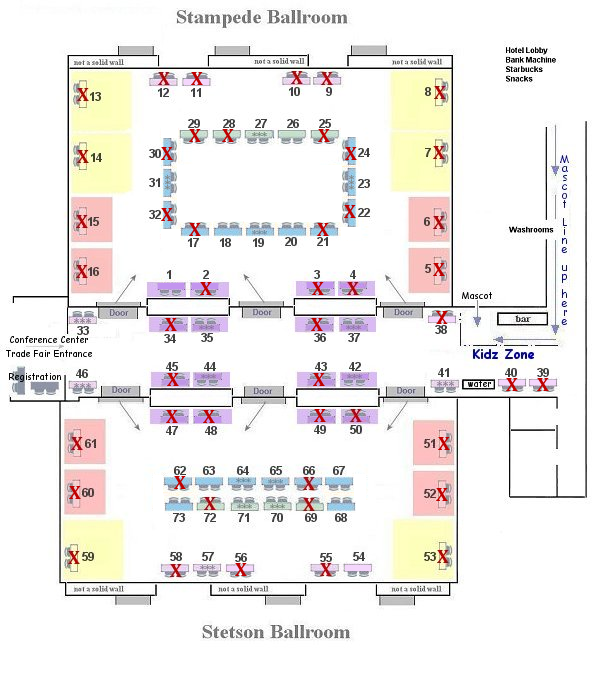 – Business name and table location shown in our trade show guide. – 6 foot table & 2 chairs in an approximate 8×8 space. Please bring your own table cloth. – Table top use only. No items on floor. Storage under table is permitted. – Use of vertical floor sign behind table or sign hung on wall behind table is permitted. – 6 foot table & 2 chairs in an approximate 8×4 space. Please bring your own table cloth. – Use of vertical floor sign beside table or sign hung on wall behind table is permitted. – Use of vertical floor sign behind table, beside table (if space is available) or sign hung on wall behind table is permitted. – Vertical signs, floor shelving or clothing racks are not permitted at blue tables. – Sign hung on front of table only. – Vertical signs, floor shelving or clothing racks are not permitted at green tables. – Sign hung on front of table is permitted. Payments Accepted: Paypal (Visa, M/C, A/E) or Online Bank Transfer (payment from bank account) only. We are accepting exhibitors applications up to the day before show if tables are available. Please DO NOT fill out the form below unless you are prepared to pay for your table TODAY. If your table is not paid within 24 hours your table booking will be removed without notice. To APPLY for an exhibitor table at our up and coming show please fill out the form below. Attention: Direct sales businesses please check our current exhibitor list to see if your business is listed. Only one rep from each company will be accepted. If you do not hear from us within 24 hours PLEASE check your spam/trash folder. We will send you several emails regarding your table booking. Due to the new anti-spam law you will need to sign up for our newsletter to receive all other future trade show news and updates. Sign up now!